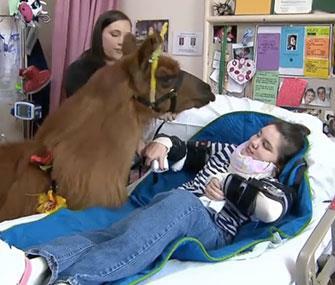 Therapy llamas. Yeah, it’s a thing. Ever feeling blue and think, "God, I wish I could hug a llama right about now"? Well you can! 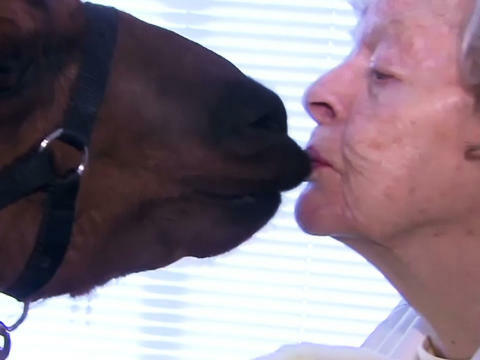 Therapy llamas and alpacas are being used all across the country to buoy the spirits of the elderly and ill, bringing their fuzzy adorableness right to your door for some therapeutic TLC (that’d be Tender Llama Care). Check out these images of therapy llamas doing their love thing. Imagine walking down the hall and stumbling across an adorable llama rump. You’re smiling, aren’t you? They’ll even shave for you (a lot of guys won’t do that). You can even dress them up! Holy wow! Plus, they will totally smooch you. And you’ll always have a Valentine. They’ll stop by for a bedside snuggle. Even if you’re a little wary at first, you have to give it a try.